The Senior Scouts, before coming to the Annual Summer Camp were required to prepare a serve a dinner for the family using roasting and boiling cooking methods and serve on time and hot, and with good catering manners. In addition they had to bake a large cake sufficient to serve all those in camp, these were very well cooked and excellently presented, nothing was left they were that good. 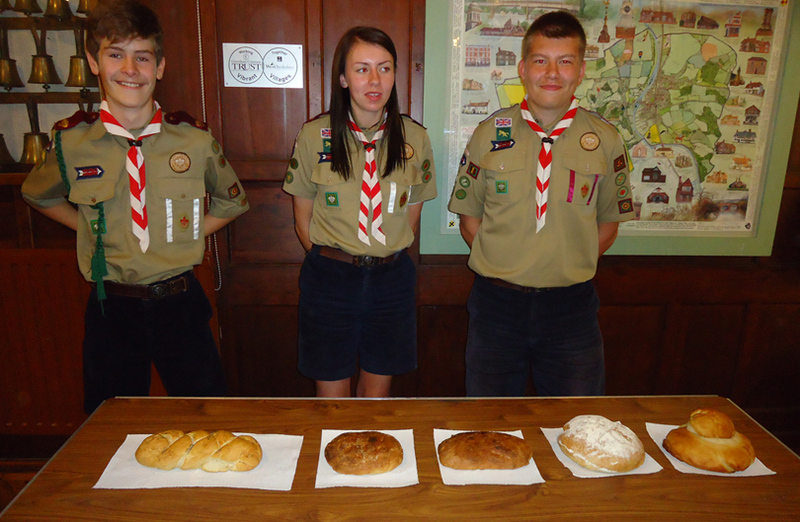 Finally after camp the Senior Scouts had to prepared and bake a loaf, no bread mixes or bread makers, and bring these along to the Scout meeting for the Scouts to sample and make judgement on whether they passed or failed. There were platted, white round sandwich, and cottage loaves produced. We are pleased to announce that Jack, Josh, Sebastian, Abigail, and James all passed and were duly presented with their well earned Senior Scout 'Master Cook' badge, well done to all five. Another great challenge for the Senior Scouts that they seem to just love doing and such a useful thing to know to improve their life skills. The harder you make the challenges the greater they rise to meet them.